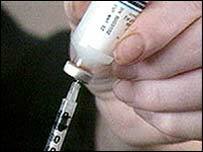 US health experts have recommended the approval of a form of insulin that can be inhaled rather than injected. The drug, Exubera, is designed to offer diabetics an alternative to their daily insulin injections. Exubera can be used for Type 2, the most common form of diabetes, but will not replace all the shots needed by some with the less common Type 1. However, US regulators have questioned the safety of the drug when used by people who smoke or have lung disease. They expressed concern about the long-term effects of the drug and its manufacturers - Pfizer, Sanofi Aventis and Nektar Therapeutics - have agreed to continue studies until 2019. "We understand the need to assess the long-term effects on pulmonary function," a spokesman for Pfizer told the Associated Press news agency. The inhaled form of insulin could be used to manage blood sugar levels for people with either type of diabetes who need insulin injections before meals. However, at this stage the drug is unlikely to replace the longer-acting injections that people with Type 1 diabetes need to take in the morning or before bed. During drug trials, researchers found that inhaled insulin generally was as effective as injections in controlling blood sugar levels - but it has yet to be tested for its longer term effect. Some patients who took inhaled insulin complained of coughing and a small decrease in breathing capacity. The recommendation to approve the Exubera was made by a panel of Food and Drug Administration (FDA) advisers. The FDA usually follows the recommendations of its advisory committees, but is not required to. Diabetes UK said the recommendation could be a first step towards putting an end to insulin injections for the 700,000 people in the UK who need daily injections to stay alive and healthy. Douglas Smallwood, chief executive, said: "This is exciting news and it is hoped that inhaled insulin could be a reality for people in the UK within the year. "Since insulin was discovered in the 1920s injections have been the only option. "Many attempts have been made to come up with new treatments and at last we appear to be close to success. "While it will not be suitable for everyone this could make a real difference to the daily lives of many people with diabetes." However, Dr Martin Press, a consultant endocrinologist at the Royal Free and Cromwell Hospitals in London, said insulin was administered to relatively insensitive areas of the body such as the leg using tiny needles. "Frankly you hardly feel it, so I don't personally see that this represents a major advance."